I. Contents of First Section. According to the Pentateuchal law, the false witness suffers the penalty which he intended should fall on his guiltless brother (Deut. xix. 19). However, there are cases where the same penalty can not be inflicted, as where conspirators would degrade a priest by falsely declaring him to be the off-spring of a union between a priest and a divorcée, a union that would debar him from participating in priestly functions (Lev. xxi. 13-14); or where they would bring about an innocent man's banishment to a city of refuge by falsely charging him with manslaughter. In either case the same penalty can not be imposed: in the first instance, because the witnesses' children, who are entirely innocent, would be tainted; in the second, because the cities of refuge are for the protection of the involuntary homicide only (see Homicide). Therefore the penalty is commuted from degradation or internment to flagellation. But in general the same penalty is meted out to false witnesses. Thus, where they conspire to have one adjudged indebted to another in a certain sum of money, and it is legally proved that their testimony is fabricated, they are jointly condemned to pay the accused a like sum. Or, where they testify that A had borrowed from B a certain sum to be repaid at the end of a month, and it is proved that the loan was made for ten years, they are jointly fined to the amount that would be given for the use of the sum in question for the period of ten years less the one month. If among a large number of witnesses one is discovered to be debarred from testifying in the case before the court, or to be disqualified from bearing witness anywhere, the whole number is disqualified. An escaped convict, being recaptured and brought before the tribunal that had originally convicted him, can have no new trial, but is dealt with according to the sentence passed. If such a one is brought before another tribunal and a legal number of witnesses testify that in their presence a certain court had found him guilty of a certain crime, and that he had escaped before suffering the penalty, the latter court is bound to have the convict duly punished. The chapter concludes with sentiments opposed to capital punishment. 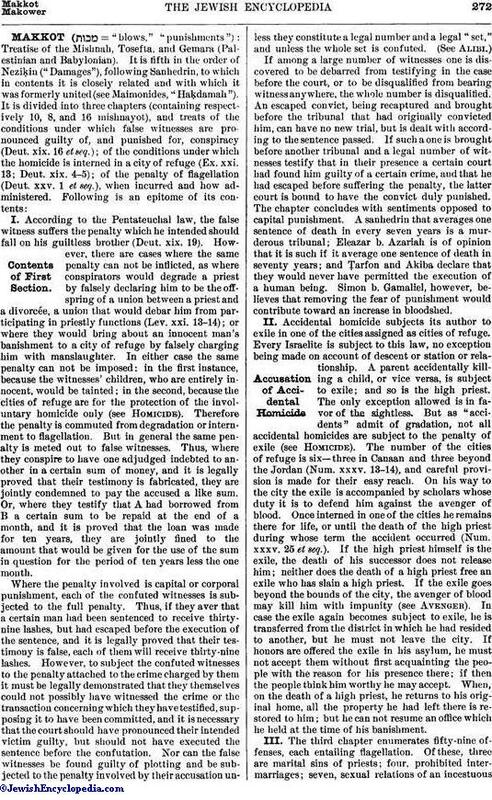 A sanhedrin that averages one sentence of death in every seven years is a murderous tribunal; Eleazar b. Azariah is of opinion that it is such if it average one sentence of death in seventy years; and Ṭarfon and Akiba declare that they would never have permitted the execution of a human being. Simon b. Gamaliel, however, believes that removing the fear of punishment would contribute toward an increase in bloodshed. II. Accusation of Accidental Homicide. Accidental homicide subjects its author to exile in one of the cities assigned as cities of refuge. Every Israelite is subject to this law, no exception being made on account of descent or station or relationship. A parent accidentally killing a child, or vice versa, is subject to exile; and so is the high priest. The only exception allowed is in favor of the sightless. But as "accidents" admit of gradation, not all accidental homicides are subject to the penalty of exile (see Homicide). The number of the cities of refuge is six—three in Canaan and three beyond the Jordan (Num. xxxv. 13-14), and careful provision is made for their easy reach. On his way to the city the exile is accompanied by scholars whose duty it is to defend him against the avenger of blood. Once interned in one of the cities he remains there for life, or until the death of the high priest during whose term the accident occurred (Num. xxxv. 25 et seq.). If the high priest himself is the exile, the death of his successor does not release him; neither does the death of a high priest free an exile who has slain a high priest. If the exile goes beyond the bounds of the city, the avenger of blood may kill him with impunity (see Avenger). In case the exile again becomes subject to exile, he is transferred from the district in which he had resided to another, but he must not leave the city. If honors are offered the exile in his asylum, he must not accept them without first acquainting the people with the reason for his presence there; if then the people think him worthy he may accept. When, on the death of a high priest, he returns to his original home, all the property he had left there is restored to him; but he can not resume an office which he held at the time of his banishment. The third chapter enumerates fifty-nine offenses, each entailing flagellation. Of these, three are marital sins of priests; four, prohibited inter-marriages; seven, sexual relations of an incestuousnature; eight, violations of dietary laws; twelve, various violations of the negative precepts; twenty-five, abuses of Levitical laws and vows. When the offense has been persisted in, the punishment depends on the number of forewarnings (see Hatra'ah). The Mishnah gives thirty-nine as the maximum number of stripes the court may impose for any one misdemeanor; but the convict must be examined as to his physical ability to endure the full count without endangering his life. The convict is bound in bent position to a post, and the public executioner administers the punishment with a leather strap while one of the judges recites appropriate Scriptural verses (Deut. xxviii. 15, 29; xxix. 8; Ps. lxxviii. 38). Any one guilty of a sin which is punished by excision may be cleared by flagellation. The author of this midrash, Ḥanina b. Gamaliel, adds, "If by the commission of a sin one forfeits his soul before God, so much the more reason is there for the belief that, by a meritorious deed, such as voluntary submission to punishment, his soul is saved." The tractate concludes with a few haggadic passages bearing upon the punishment awaiting the sinner and the reward reserved for the righteous. 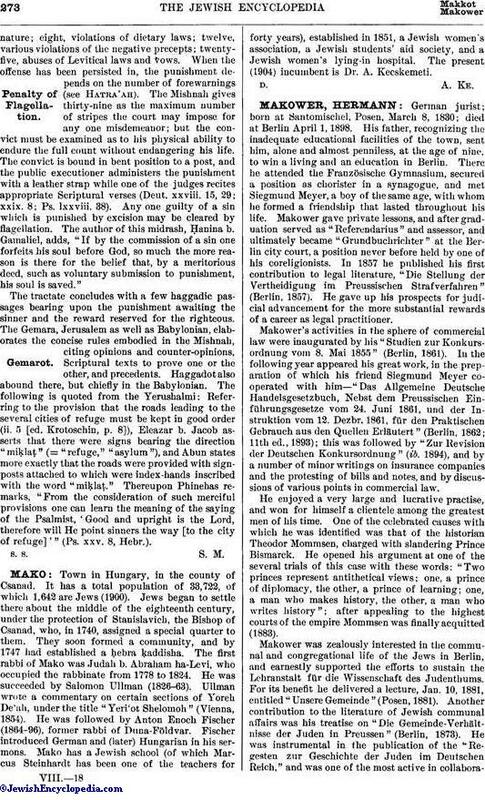 The Gemara, Jerusalem as well as Babylonian, elaborates the concise rules embodied in the Mishnah, citing opinions and counter-opinions, Scriptural texts to prove one or the other, and precedents. Haggadot also abound there, but chiefly in the Babylonian. The following is quoted from the Yerushalmi: Referring to the provision that the roads leading to the several cities of refuge must be kept in good order (ii. 5 [ed. Krotoschin, p. 8]), Eleazar b. Jacob asserts that there were signs bearing the direction "miḳlaṭ" (= "refuge," "asylum"), and Abun states more exactly that the roads were provided with sign-posts attached to which were index-hands inscribed with the word "miḳlaṭ" Thereupon Phinehas remarks, "From the consideration of such merciful provisions one can learn the meaning of the saying of the Psalmist, 'Good and upright is the Lord, therefore will He point sinners the way [to the city of refuge]'" (Ps. xxv. 8, Hebr. ).